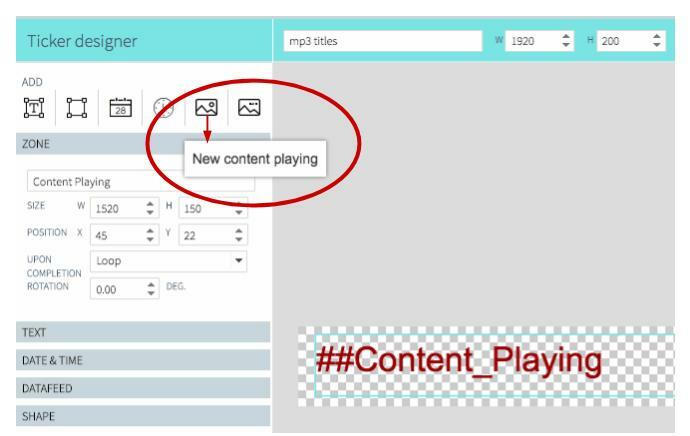 Create a template with both the mp3 playlist and the media to display. For a regular 1920×1080 screen resolution, initially create the template at 3840 x 1080 (twice as wide). Add your mp3 playlist to the right at a size larger than the output screen – like 1920×1090. The mp3 playlist zone must be larger than 1920×1080 because the ticker will display the title for the largest media zone on a template. Move the mp3 zone to the position X=1920 and Y=0. Modify the template resolution to 1920×1080, The mp3 playlist will still be in the template but off to the right. Add your playlist consisting of images/videos at 1920×1080, in the position X=0 and Y=0. Save and Publish the Ticker.